President Donald Trump reportedly told Turkish President Recep Tayyip Erdoğan about that change over a phone call. In a phone call with Turkey's leader, President Donald Trump reportedly said the U.S. would stop arming Kurdish fighters in Syria. The White House seemed to confirm that after the news broke in Turkish media — although the White House statement doesn't mention the Kurds by name. According to the AP, the White House statement says Trump told President Recep Tayyip Erdoğan of "pending adjustments to the military support provided to our partners on the ground in Syria." Turkish officials lauded the decision; the U.S.-backed YPG Kurdish fighters are considered by Turkey to be one and the same with the PKK, a Kurdish independence group that both the U.S. and Turkey consider to be a terrorist organization. Regardless of how it plays out with its allies, the U.S. may not need extra help in Syria now that ISIS is facing military defeat. The terrorist group recently lost control of its Syrian stronghold and de facto capital Raqqa. The liberating force included U.S.-armed Kurdish fighters. And there are reportedly hundreds more U.S. troops in Syria than originally disclosed. 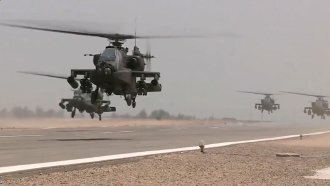 Multiple reports indicate the Pentagon is set to announce that around 2,000 troops are on the ground there — significantly more than the official count of 503.